Update: Vancouver Police are reporting that 11 year old Asana Gross has been found safe and well near Main Street and East 12th Avenue. Asana had been reported missing earlier this afternoon by her father after wandering off from their car which was parked near East Broadway and Commercial Drive. The family is visiting from California. Vancouver Police are requesting the public's assistance to help locate 11 year old Asana Gross who went missing from the Broadway and Commercial area around 2:30 pm today. The young girl is visiting Vancouver from California and may have become lost as she is not familiar with the city. 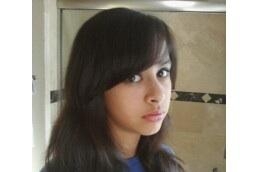 Asana Gross is part Hispanic, 5'3" tall, 85 lbs., with dark brown shoulder-length wavy hair. She is wearing a black athletic jacket that says "marathon finisher" on the back, capri blue jeans and sandals with a Canadian flag logo on them. Police and family members are actively searching for the young girl and are hoping the public will be able to assist in reuniting Asana with her family. Anyone who sees Asana is asked to call 9-1-1 and wait with her until police arrive.